Pattaya Beach is a 2.8 kilometer long beach which stretches from Walking Street and South Pattaya Road at the southern end, to the Dusit Thai hotel at the northern end where Pattaya Beach Road meets North Pattaya Road and the Dolphin Roundabout. Being easy to access from any area of downtown Pattaya (between North Pattaya Road and South Pattaya Road) makes Pattaya Beach a convenient and cheap place to chill out for the day. The prices below are what I was quoted by vendors on the beach in January 2019. Most seats on Pattaya Beach are the lounger type (photo above) but some vendors also provide the traditional “fold away” deck chair. The loungers cost 100 baht per day, and the deck chairs cost 40 baht per day. Cost of jet ski hire on Pattaya Beach: I was quoted 1,500 baht for 30 minutes, I never tried to barter but there’s no reason you should not. The Pattaya Jet Ski Scam: It seems to have gone quiet these days, but who knows when it will rear its ugly head again. Personally, I would think twice before renting a jet ski in Pattaya. Banana Boat rides: I was quoted 1,200 baht for 30 minutes. The price is per ride, not per person. So however many people get on it’s 1,200 baht. 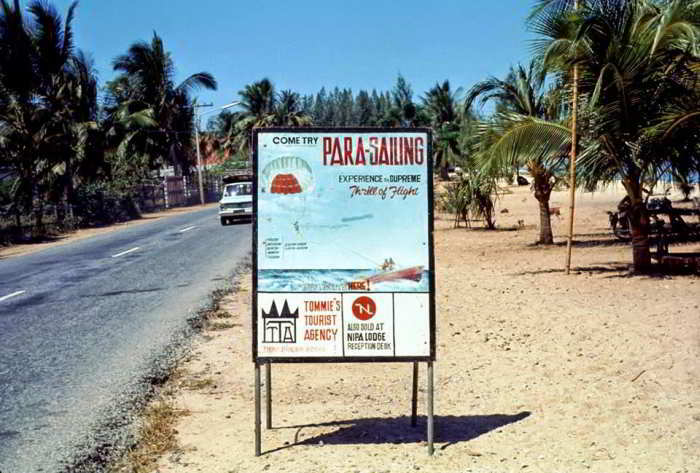 Para-sailing: I was quoted 1000 baht, but I’m not sure if this included the boat ride out to the pontoons. Bathing in the sea at Pattaya Beach !! 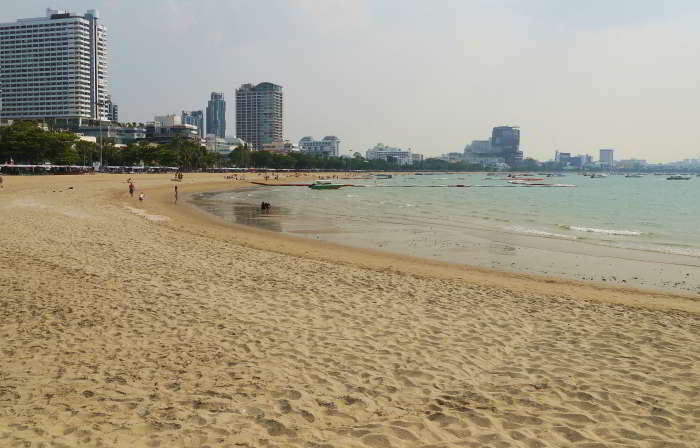 Is it safe to swim in the sea at Pattaya Beach? There are safe swimming zones on Pattaya Beach – so in that respect it’s safe to swim and bathe without having to worry about jet-ski and boat traffic. The real issue is water quality. 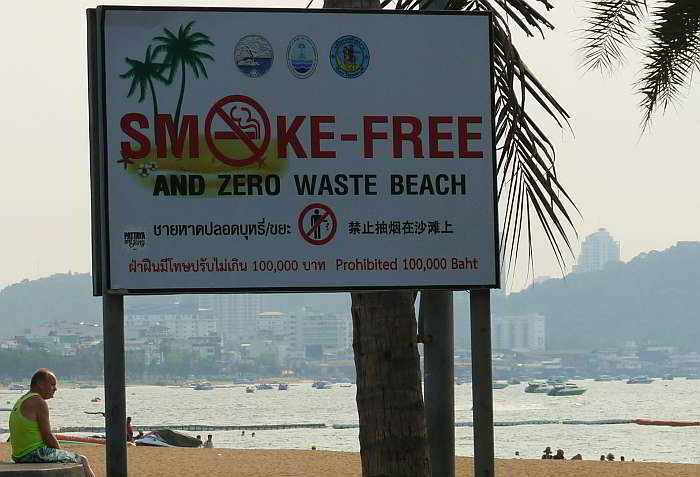 Just how clean – or dirty the sea water is on Pattaya Beach is debated on a quite regular basis on local forums. My own recommendation would be to bathe and keep your head out the water, rather than swim. 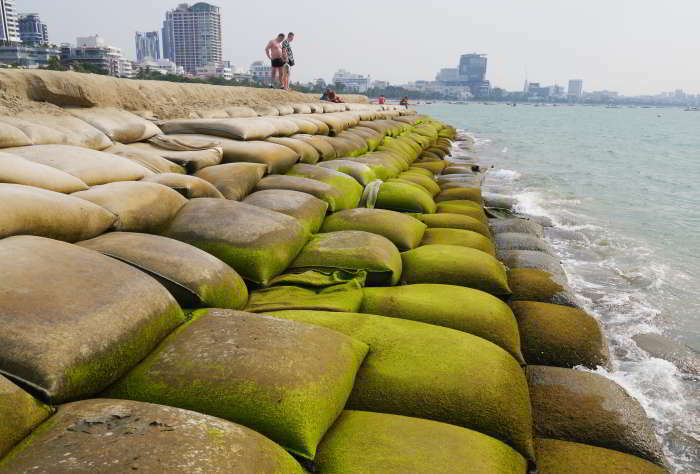 Early in 2018 a major construction project called the “Pattaya Beach Nourishment Program” began. 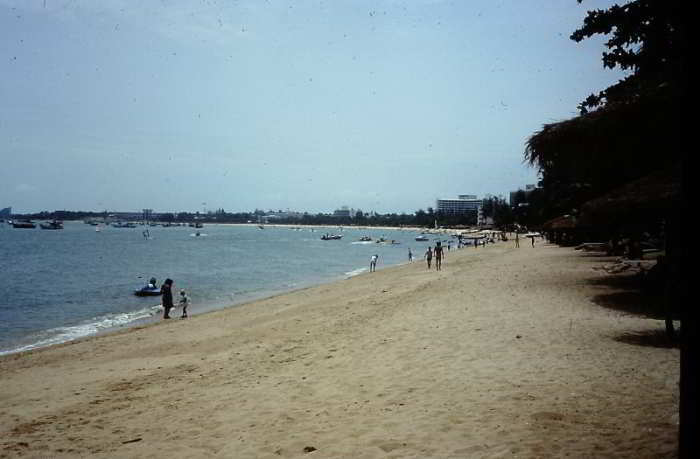 The aim of the project is to restore Pattaya Beach to its former glory. 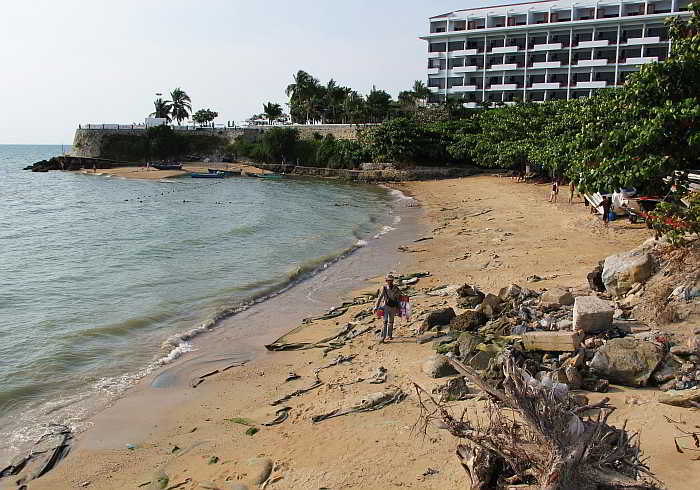 Before the project started some areas of Pattaya Beach had been reduced to a width of just 2 – 3 meters by erosion. 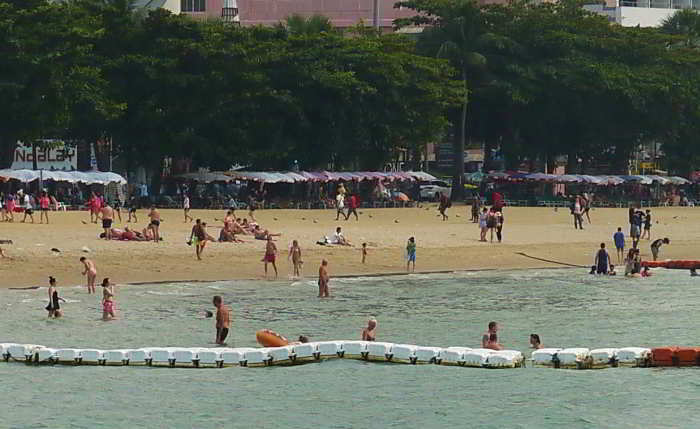 The Pattaya Beach Nourishment Program will eventually restore the width of Pattaya Beach to a minimum of of 30 meters by laying a foundation of sandbags on the beach and then filling the beach with 360,000 cubic meters of sand dredged from the seabed around an island close to Pattaya. 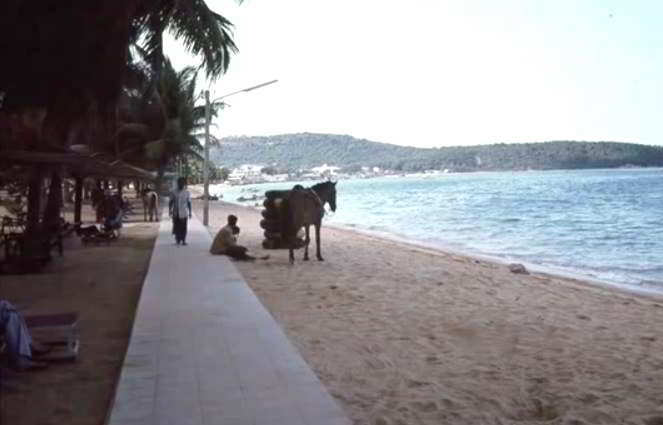 So far, the most noticeable transformation has been at the north end of Pattaya Beach. Here’s a couple of before and after photos (below) of Pattaya Beach at the Dusit Thani. 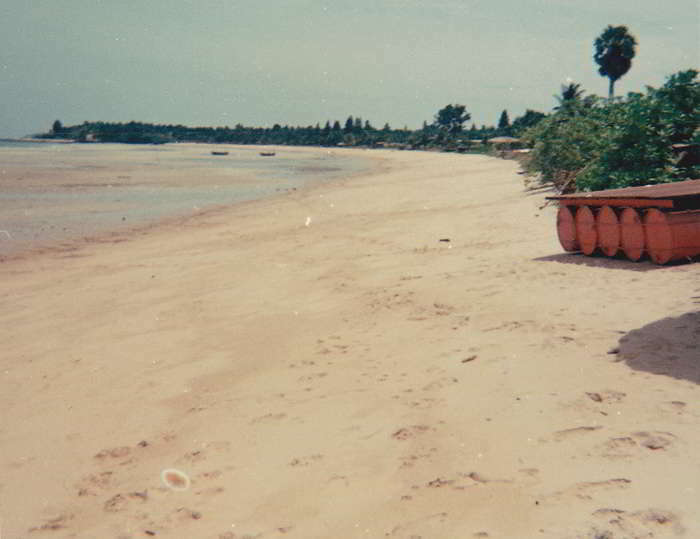 The photo above is of the beach in front of the Dusit Thai hotel before the Pattaya Beach beach restoration program began. 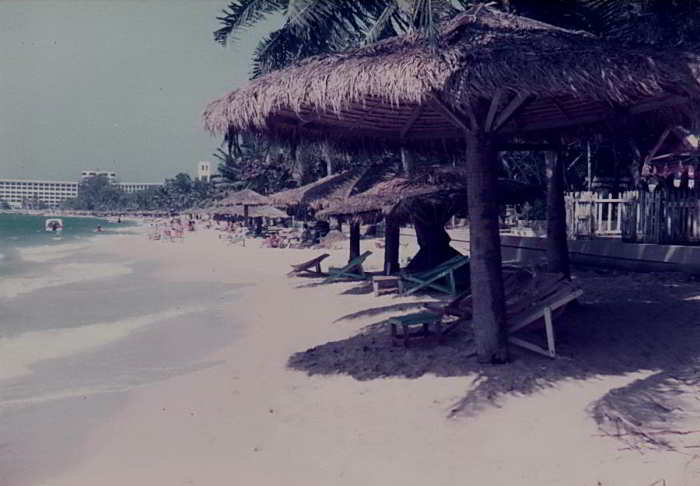 And (above) a photo of the beach in front of the Dusit Thani after restoration was completed. I’m sure you will agree – that’s a remarkable transformation. That’s a huge area of beach which has been reclaimed – and there’s more than enough room to kick a football or throw a Frisbee. 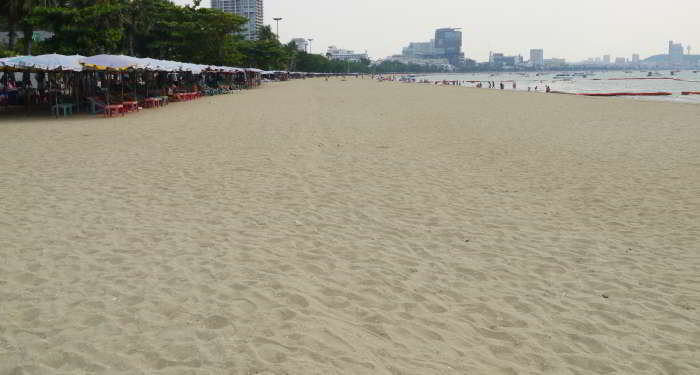 The photos below are the new beach around north and Central Pattaya. Taken on 17th January 2019. 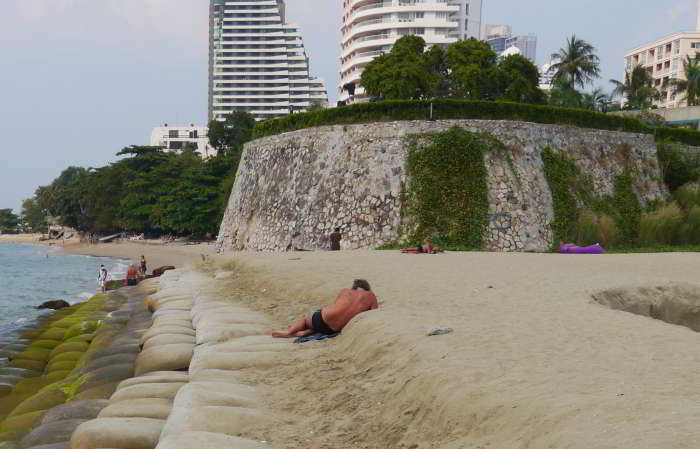 Take a walk from Pattaya Beach to Naklua: On the photo (above) you can see the retaining wall of the Dusit Thani. There was previously a number of large rocks at the base of the wall. Despite a rickety old wooden bridge pathway crossing the rocks it was virtually impossible to get around the corner of the wall and access Nakua Beach from Pattaya Beach. Since the beach has been reclaimed you can walk easily to Naklua Beach, then carry on to Wongamat Beach. from Wongamat you can either head back to Naklua Road or continue to Wong Prachan Beach then cut through the Garden Cliff Resort and back to Naklua Road before you arrive at the boundary wall of the Sanctuary of Truth. I would guess the photos below are dated around the 1960’s and 70’s. 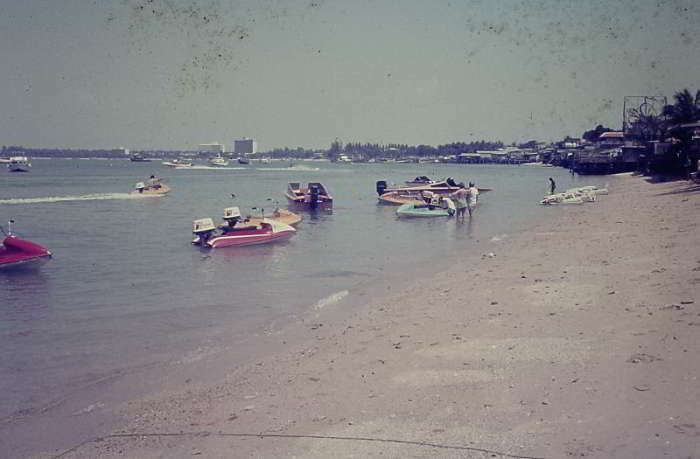 It’s difficult to find photos of Pattaya beyound the 60’s and 70’s. I guess nothing much happened in the sleepy old fishing town before the advent of the Vietnam War and an influx of American troops, at least if it did – nobody caught it on camera.